Chapter 20 is all about winglets. This chapter involves building the large upper vertical fins, mounting them to the wingtips, building and mounting the lower vertical fins, fabricating the rudders and hooking up the rudder controls. The winglets of the Long-EZ helps make the airplane very efficient, since they not only provide directional stability, but also help eliminate drag due to wingtip vortices. The winglets provide directional stability (in other words, they make sure the airplane nose is always pointing into the wind) - the same way a conventional aircraft uses a vertical stabilizer to weather-vane into the wind. Notice in the picture below how the winglets are far aft. This provides positive stability since they are located far enough aft of the CG (center of gravity). The rudders on the trailing edge allows the pilot to turn the nose to the left or to the right. One might be surprised to learn that the Long-EZ only deflects the rudder in one direction - outboard. This is because the winglets are located far to the left and right of the CG centerline buttline. If the rudder would be deployed inboard, the drag of the rudder would offset the yaw moment caused by the lift of the rudder - making it unproductive. However, deploying the rudder outboard, the rudder drag actually provides a yaw moment in the direction the pilot intends. To make the long story short, if the pilot wants to turn the nose to the left, he or she steps on the left rudder pedal, deploying the left rudder of the left winglet outboard. The right rudder does nothing. And visa-versa. The job of an airplane wing is to produce lift. To put it in simple terms, it does this by deflecting incoming air down. For every action, there is an opposite and equal reaction - so the wing is pushed up, thereby creating lift. At the tip of the wing, the air from the bottom surface (high pressure) gets sucked into the upper surface of the wing where low pressure exists. This causes a vortex. Wingtip vortices are bad in that they reduce the wing's efficiency - not only do they produce drag, they also reduce the wing's ability to produce lift. In order to make up this lift, the wing has to fly at a higher angle of attack, thereby producing even more drag. Aerodynamicist add a winglet to the tip of a wing to prevent the high pressure air at the bottom of the wing from rolling over to the top surface - thereby eliminating (or drastically minimizing) the vortices. The science of optimizing a winglet such that you maximize the efficiency of the wing is an art, and not as simple as it sounds since it depends on many factors such as what speed the airplane will be cruising at, wing loading, etc. To further help reduce vortices on the Long-EZ, not only does the winglet act like a fence, but it also provides lift in the opposite direction of the vortex. 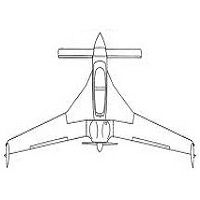 In flight, the upper winglet produces lift inward (deflecting incoming air outboard), and the lower winglet produces lift outward (deflecting incoming air inboard). This fights the natural direction of a wingtip vortex, making the wing that much more efficient. There are two major plan changes to note in this chapter: 1) high-performance rudder mod, and 2) internal rudder belhorn. Soon after the first Long-EZ took flight, modifications were already underway to improve its design. RAF came out with a set of plans called "high performance rudders" - available in the documents section. While this is an optional mod, it's a no-brainer. Who doesn't want more rudder control? The original Long-EZ rudders are only 14.5" tall by approx 11" wide. The high-performance rudder spans most of the winglet - being 43.5" tall and approx 6" wide. The original rudders and high-performance rudder were deployed using an external belhorn that stuck outboard of the rudder. A cable pulls on this tab, deploying the rudder. Clever folks came up with an internal belhorn system. This gives the airplane a much cleaner look (since there are no cables or tabs exposed outside), while also reducing parasite drag. The internal belhorn can only be used with the high-performance rudders. The instructions on setting up an internal rudder belhorn can be found in the documents section.